Mold Making: we have domestic, offshore, and in-house mold making facilities. Once the prototype is finished, the mold can be designed and quoted. From there, our expertise in mold making will become invaluable. 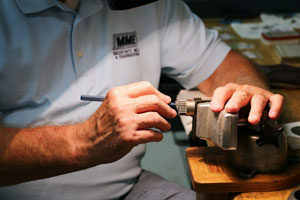 At Midstate Mold, there are several skilled experts with over 180 years’ experience in mold making. As part of the mold making process, we design, quote, build, test, and improve the mold all based on the prototype part. We have all of the equipment necessary to manufacture prototype and production molds in-house. We have the ability to make molds right in our shop. While other options are available, if a company chooses to go this route, they can know the mold was handled by Midstate exclusively from start to finish. An important part of this is that Midstate assumes full responsibility for the whole process. There is no finger pointing between the mold maker and the manufacturer. We are responsible for the whole process and have eliminated the option of shifting the blame to someone else. This means you will get a straight answer and a resolved issue without playing the arbitrator between two separate companies. We also have low-cost tooling available offshore. Additionally, we can offer lower cost tool production offshore if that suits the customer’s needs best. We still stand fully behind the quality of the mold and the finished product. And we offer Mold Maintenance. Molds (or tools) don’t run flawlessly on their own. One of the most important advantages of Midstate is our ability to perform maintenance on molds in our shop. Our onsite shop allows us to maintain and repair a mold as needed. This contributes heavily to our ability to keep production at the expected rate. We perform frequent checks on molds before and after use to ensure they are ready to operate impeccably. Many companies don’t have the capability to provide such a comprehensive start to finish mold making experience.